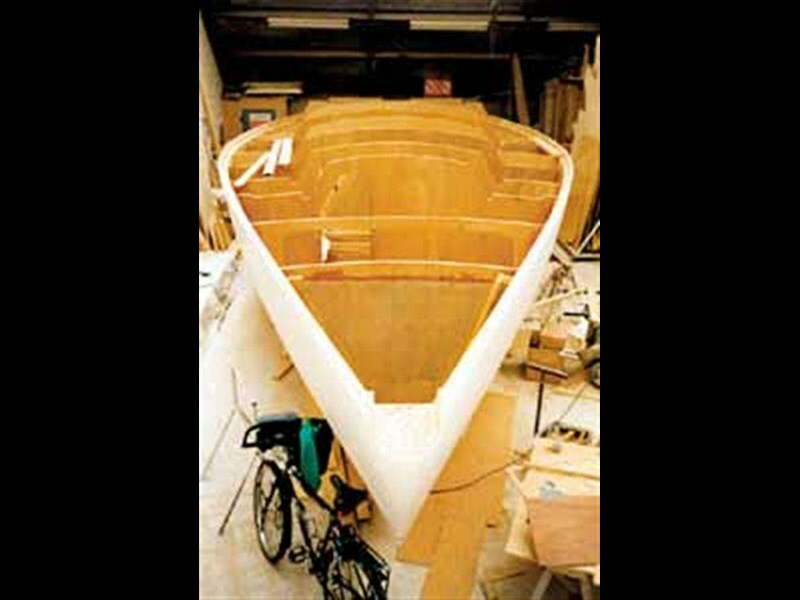 Not so long ago, when most yachts were crafted from wood and not just cloned in fibreglass from a factory mould, a new boat was a source of wonder and people would travel miles to see her launched. With Diva, Lindsay Wright fell under the spell. The birth of a hand-crafted wooden boat is an event - and when that boat combines the best of modern technology with the warmth and beauty of wood, she is extra special. Diva, John and Kate Driver's new 13.5m (44') Angelo Lavranos-designed cutter, is that rare combination, with the added fillip of modern design and construction techniques and a healthy dollop of her owners' hard won cruising experience crafted in for good measure. The Driver's new boat, began while they were still cruising in their old one, Concerto, a Raven 26 hull with timber deck and cabin. 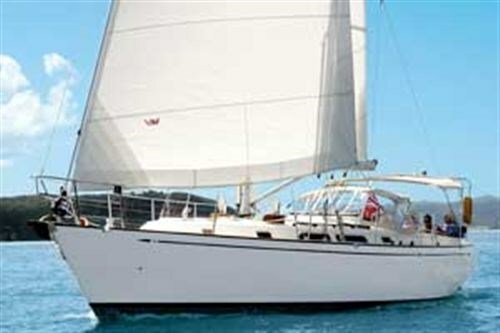 She was a joy to sail, and after 24 years cruising in her, including a trip to Fiji, it was time for a new boat project. 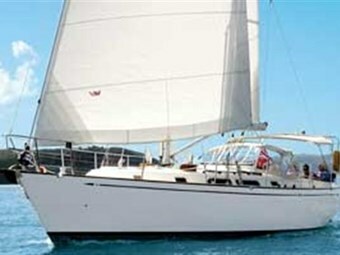 Concerto, too was the result of some careful thinking about cruising boats and sailing them. "My first boat was a 23 foot (7.1m) JOG boat I built in New Plymouth as a teenager," says John, "and our Christmas cruises were down to the Marlborough Sounds and back. After the 1967 Noumea race, a trans-Tasman delivery in a Falmouth Quay punt followed, and trips around the Pacific Islands - as far north as Hawaii." While crewing for Martin Foster in the 1980 Two-Handed Round North Island race John met Kate, who was assisting with the race's administrative details, and the couple became a crew. John had always admired the Swans (built by Finnish firm Nautor) and started thinking: "why not build something similar myself?" Some early Swans were designed by Sparkman and Stephens, and when the Drivers were ready to approach a designer, the first people they spoke to was former S&S staffer, Angelo Lavranos. "I'd already met Angelo while we were building another one of his designs, Wizard, at Kevin Johnson Boatbuilders," says John. "He's wonderful to deal with - we wanted a powerful, moderate displacement boat that sailed well to windward, and performed well in light airs. She had to be comfortable in all conditions and have good internal volume. Angelo really listened to what we wanted and came up with exactly the boat. He's used to dealing with big project, big factories building hundreds of production boats - but he was just as helpful to a modest Kiwi couple like us building our own cruising boat. In fact, his interest throughout the project was wonderfully encouraging." Kate kept on at her job as PA with a leading NZ-owned fund manager, while John started work full time on the new boat, at the back of Kevin Johnson's workshop. Lavranos' plans included computer generated mylar patterns for the nine bulkheads so they could be cut straight out of scarfed sheets of 18mm Meranti plywood. Then they were stood up and used as formers for the hull construction. Planking is 40 x 25mm, clear Fijian kauri, with convex /concave edges, epoxy glued and nailed with silicon bronze boat nails. "There are two woods I really love - kauri and teak - they both have that rich, golden glow," says John, "and we wanted the hull planking visible inside the boat." Diva's keelson was assembled next, from five 20mm laminations of kauri, tapered fore and aft, with another 100mm in a keel stub outside the hull. It is studded with 19 25mm diameter stainless steel keel bolts that hold the four tonne lead bulb at the bottom of her 1.8m draught. After 12 months or so, Diva's hull had taken shape and a layer of 850gm triaxial glass was added, followed by a skin of 650gm kevlar and another of six ounce boat cloth to guard against abrasion, all applied with epoxy resin. Another layer of 850gm triaxial cloth was laid on the inside - "I spent hours in the bilges," he grins ruefully. Painstaking care is written all through Diva; this boat was built by the people who will take her to sea. Diva's hull was turned right way up and kahikatea (white pine) deck beams installed to support her plywood decks and cabin sides. Next step was the cabin top with a 9mm layer of ply, topped by 25mm of high density foam and another layer of 6mm plywood with six ounce boat cloth epoxy glued to it. 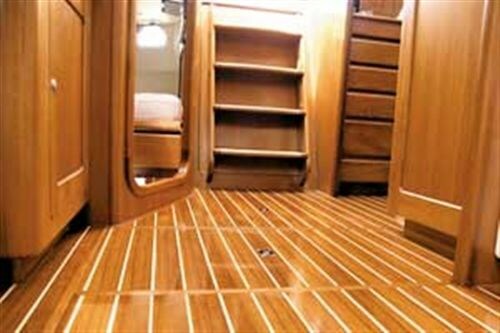 An 18mm gap was left between it and the deckhead liner to run electrical wiring and to act as insulation. Kauri floors were laminated into Diva's shapely form and joinery started to sprout between the bulkheads. A solid step was laminated from Iroko hardwood to handle the mast loads. By now the Drivers were 18 months into the project, but the Devonport workshop which housed Diva was needed for another Lavranos project (Oddyseus). So they trucked Diva's hull and decks to Gulf Harbour at Whangaparoa and built a plastic horticultural shed over her, loaned a friend's Lilyput caravan and together, with John's machinery, moved in with the boat. The balanced spade rudder was formed onto a stainless steel web, from 18mm layers of laminated plywood shaped, then skinned with triaxial glass, with kevlar on the leading edge and toe. An 89mm diameter solid stainless steel stock bears steering strains. "We were both working a seven-day week - the only way to get it done. We might have seemed rude to our visitors at times," says Kate. "But every hour counted for a one-man boatbuilding outfit and his project-managing wife." Diva's interior began to take shape inside her 4.2m beam and teak joinery started to flow through her interior. A double bunk uses the port side of the forepeak space, with standing room and a seat beside it. Next aft is a large, immaculately finished head and shower area in gleaming white reaction laquer, with a Lavac toilet and hand basin. The other hold and cold shower, is alfresco - on the platform. Diva's craftsmanship is outstanding. Wood grain matches wood grain from fitting to fitting in a continuum of glowing golden timber. 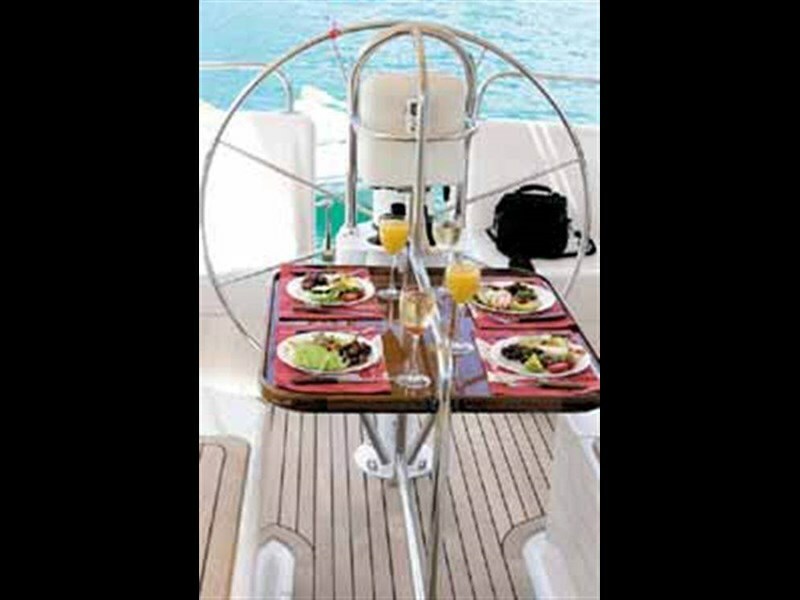 The glowing teak dining table takes pride of place in the saloon with a horseshoe shaped seat outboard of it and a centerline settee, all set up to comfortably seat six for dinner. A settee and aft facing chart table with minimal electronics: sounder, sailing instruments, GPS and VHF radio, occupy the starboard side of the saloon. "I'm a bit of a traditionalist in that area - having started with a sextant, I'm still wrapping my head around using the GPS," John grinned, "but it's pretty amazing." A spacious double cabin is nestled under the cockpit to starboard and the Broadwater Cutter gas stove looks set to produce either gourmet treats or heavy weather fodder for crew in the port side galley. An Isotherm 12 volt fridge and separate freezer keeps the raw materials cool. Diva carries 1,000 litres of fresh water in two tanks on either side of the saloon with a further 40 litres in the engine exhaust hot water system. Out in the cockpit, the Drivers' cruising experience comes to the fore once more. A spacious locker to port holds spare sails and deck gear, but also has a workbench with vice and a seat with easy access to the engine space. Big watertight lockers surround the cockpit and aft to starboard is a cannily contrived vegetable locker with through flow ventilation to keep the greens green for longer. The instrument panel mounted in front of the Sunto compass swivels to face the on either side of the big steering wheel. A Whitlock King Cobra mechanical steering system delivers lock to lock response in 1.5 turns of the wheel and, according to John, is extremely reliable and positive. After extensive market research, the couple settled on a Nanni/Kubota 5.280HE diesel to power their "neo-classic" cruiser. "We liked the fact that it's naturally aspirated - a good straightforward engine," says John, "which we also fitted an 130-amp alternator to back up the 2x 90-watt solar panels on the arch." The five cylinder power plant delivers 62 horsepower (46.2kW) which drives a 300mm diameter three bladed Maxprop through a 2:1 Hurth hydraulic gearbox. Fuel is pumped from the 300-litre capacity tank in the fin keel up to a 130-litre day tank and from there, through matching Racor filter/water traps to the engine. Cruising speed for the 13500kg yacht is about six knots with the engine turning over at a lazy 1400rpm. Last but not least, sailpower was added to Diva's growing equipment list. A 17.5m Selden twin spreader rig (desk-stepped) supplied by Nordic, together with Andersen winches and Furlex furler, was stepped on her keel. A set of stout cruising sails were manufactured by Simon Willis loft in Kerikeri. "We worked really hard to get the mast ready to step on John's 50th birthday - that was a milestone," says Kate. Finally, three-and-a-half years after first discussing the design with Lavranos, Diva took to the water for the first time on July 24 and floated perfectly on her design waterline. Fitting out work and trialing equipment continued on her marina berth, but in January Diva spread her sails and set out on a maiden cruise around the Hauraki Gulf and to her home waters in the Bay of Islands. Would they do it all again? "Weelll....no," John says emphatically. "After all the hard work, we are just thrilled to have a boat which meets all the criteria we set out, and we just want to get on with sailing and enjoying Diva with all our wonderful friends who've helped, supported and encouraged us throughout the project. Not least, Angelo, and Kevin and Sue Johnson. Thus far it has been quite an adventure, and there are many more to come.